The University—What Does it Mean to You? Not many of us are thinking seriously about a university among our people except to suggest a craving for higher education. To many of us this is a passport, a key to affluent living, and a university degree bestows us with a status and earns us the respect of the community. Beyond just thinking about the university we need to discover its relevance to us black people and place it in context with the entire black community it purports to serve (in our case). A bird’s-eye view of a university and one commonly held is that a university is simply a school of idealists, dreamers who have no desire to be anything else but that. Yet it must be realized that a university is a community of people involved in a common search for the truth. TRUTH, this is the operative word. This entails a search for the self and an awareness of your community. Hence it would be quite easy to define TRUTH in terms of the needs, goals and aspirations of a people. University education for blacks has had the effect of creating a black elitist middle class that is far removed from the true aspirations of the people. Thus the result is a poor imitation of white values and they have become blurred images of their white master. The universities have produced graduates who would never understand themselves and their people. These universities have been ‘the secular refuge of mediocrity … the safe hospital of all intellectual invalids—and what is worse—the place where all forms of tyranny and insensibility found the chair where they could be taught’. You will, no doubt, agree that they are the faithful mirrors of this decadent society. Black students are today faced with a value system. They seek to understand why a particular human model which they identify as ‘part of the problem’ should be imposed upon them by a white society which has never exhibited any profound love for them. Universities today are extensions of ‘the system’. They do not offer black students an attitude of intimacy with the masses. In order for the social structure to be maintained in existence it is necessary for blacks to acquire the kind of behavior pattern which is consistent with its survival. Thus the university, as it is, is there to entrench the exploitative system and white culture models. Black students have rejected this. What then does a university mean to us? To blacks, university students are part of a wider suffering community. To them, the meaning of a university projects the idea of a community. Love and cooperation with one’s fellows is a participation in a human model of fulfillment through creative involvement in the social processes. The university offers oneness and intimacy with the people. Black students must take over the responsibility of the people’s destiny and devote themselves to the task of eradicating all evils, resolving all problems and generally transforming the spirit of the people. This is the leadership role black students are destined to play towards the development of their people. 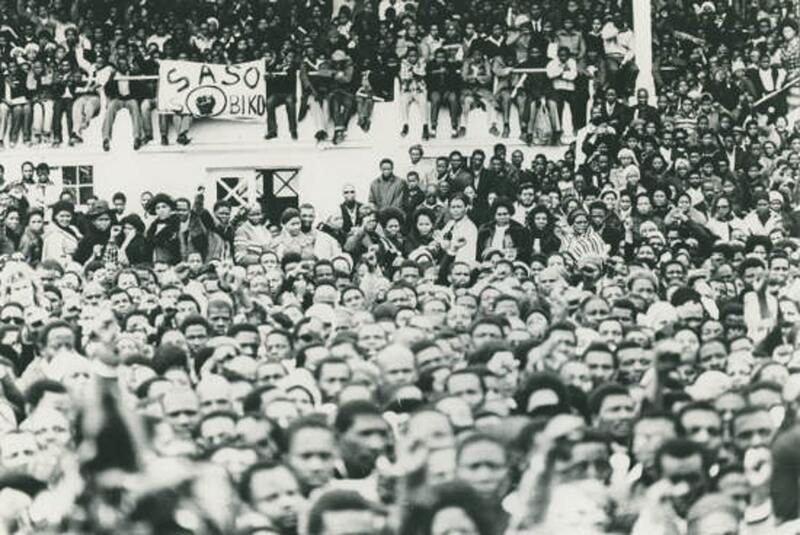 With the emergence of SASO and its aim ‘to heighten the sense of awareness and encourage them to become involved in the political, economic and social development of the black people’ has come the idealism of the black revolution, a revolution of ideas, of values and standards. To us this is a challenge and a commitment to put our ideas into practice. This involves making a community conscious of a need to undertake a venture jointly in order to meet those needs and priorities which are essential for its survival. Community development is the direction which black students must take if they are to transform their idealism into stark realism. This is the era in which we must make the mission of the university real to the world it serves. We face new realities, we are the new peoples with vast possibilities and vast horizons between us. Within our frontiers lives true humanity. We have to bring forth a new humanity with a higher conscience. This is the challenge of the university. Are you with us?